“Why on Earth have you come to Estonia?” was the first question I heard on arrival to Tallinn. Heading to sTARTUp Day in Tartu, I intended to investigate the Estonian ICT industry from multiple angles. Why do businesses outsource their R&D to Estonia? And what makes Estonia an attractive place for software developers? Estonian startup paradise – a myth or reality? As I talked to startups, successful service companies and the Estonian IT rock stars, the picture started to come out of the shadows. sTARTUP Day 2016 gathered 50 international and local speakers, more than 100 companies and 3000 visitors who came to share their experiences, ideas and business acumen in Tartu. In a series titled Estonia Profile I will reveal insights into the Estonian ICT industry. The first post will dive deep into the data on the market size, IT salaries and most demanded competences. Dubbed the Little Silicon Valley of Europe, Estonia boast one of the most dynamic and proficient ICT sectors. With a population of only 1.25 mln people, this small country has become a test-bed for new innovative technologies and a magnet for software engineers. In finding out the size of the local IT industry, I spoke with Jürgen Jõgeva from Axinom, who evaluates it at around 20K people. His estimations are very close to the official statistics. The ICT sector in Estonia employs 22,970 specialists, according to OSKA. Two cities stand out as the major Estonian IT hubs, Tallinn taking the lead (67.5%) and Tartu as a runner-up (12.5%). These smart and talented professionals make their share in the country’s economy, which constitutes 5.5% of GDP. However, the Estonian government does not plan to stop there. In a visionary plan Digital Strategy 2020 for Estonia, ICT is expected to become the leading sector of economy, which will contribute up 20% of the country’s total exports. 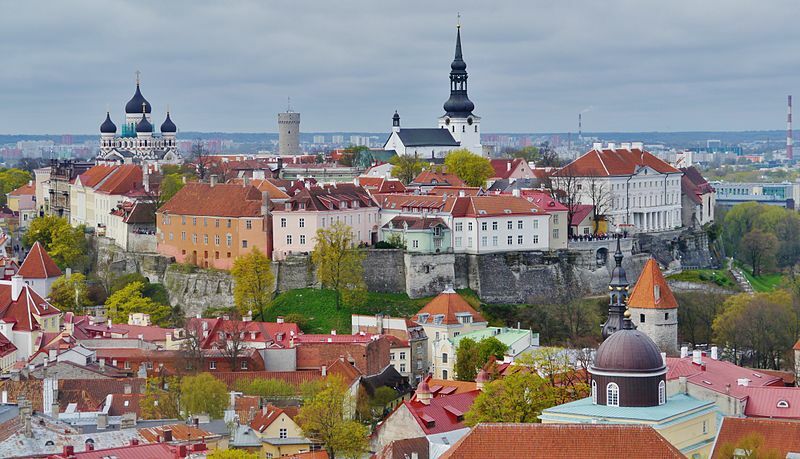 Known as the birthplace of Skype and TransferWise, Estonia is home to a wide array of prominent foreign companies who opted to run their R&D activities there. Such big names as Microsoft, SAP, Acronis (data protection), Parallels (cloud services), and Arvato Financial Solutions are worth mentioning. Growing software developer salaries is the global IT trend, and Estonia makes no exception. In the third quarter of 2016, the average gross salary in the software development sector was €1,889 which is €770 higher than the country average. These numbers won’t portray the reality as we don’t take into account taxes withheld from the gross wages. It includes personal income tax of 20%, 2.4% of unemployment insurance tax (divided between employer and employee as 0.8% and 1.6% respectively). In addition, the employer pays 33% social tax, also deducted from the gross wages. The total cost amounts to 57.8%. To find out how much money remains at disposal of Estonian software developers, I delved into some interesting numbers in a salary database Palgad, that conducts country-wide net salary surveys. A C++ programmer in Estonia has an advantage over all other developers, earning a net salary of €1,840 per month. Java and Objective-C software engineers are paid €1,660 and €1,644 respectively. .NET is slightly behind with wages of €1,610; Python and PHP developers make €1,407 and €1,397, respectively. 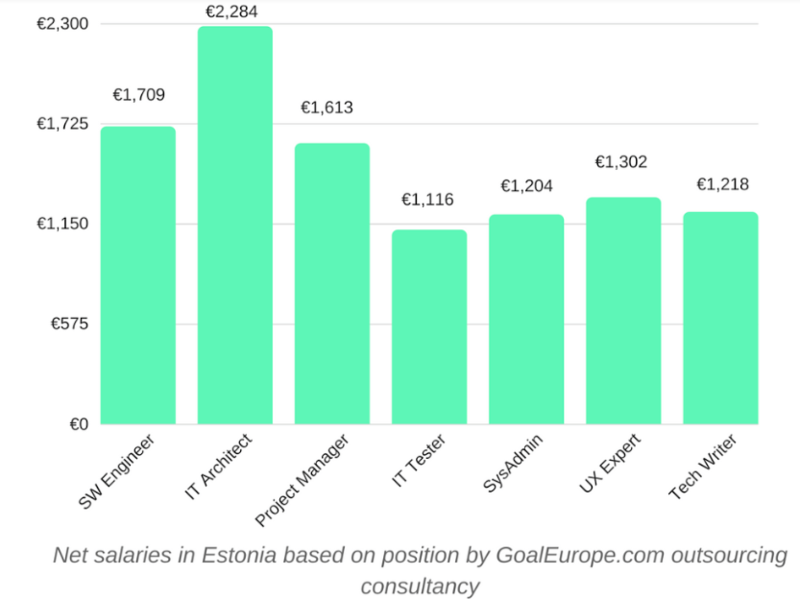 Looking into Estonian net salaries based on IT positions, top-3 go to IT Architect (€2,284), Software Engineer (€1,709) and Project Manager (€1,613). GoalEurope helps small and medium companies to build development teams in Central and Eastern Europe and select reliable outsourcing suppliers in the region. Contact us to learn more. 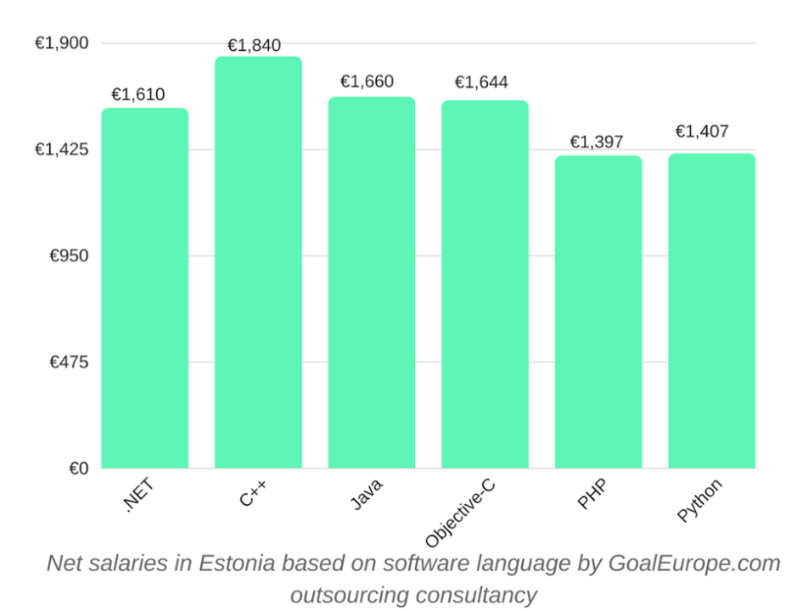 What do companies think of the average developer salary in Estonia? I asked Axinom, a company that develops and markets their own CRM, CMS, and DRM solutions with the effort of .NET and C# developers. They acknowledged paying their software talents higher salaries than the country average. “According to statistics, the average gross salary is €1,500 – 2,000 per month. In companies focused on software development and export this range is between €2,000 – 3,000 per month”. His view is seconded by Kim Smirnov, Head of IT Development at Eesti Energia. Kim comments that the average IT salary in Estonia is €3,000, but the salary range may be anything from €1,500 to €5,000 per month. With higher than average salaries, demand for software developers far outstrips the existing local supply. Till 2020 Estonia needs additional 6,400 – 8,600 specialists. To sustain these ambitions, the country works hard in multiple directions. Raising the attractiveness of software development among students is one of them. Each year approximately 1,150 young people graduate with degrees in computer science. Educational opportunities are provided outside the universities as well. In the next four years, the Estonian government plans to train additional 500 people with no IT background to become junior .NET and Java specialists. The second strategic direction in addressing the talent shortage is making Estonia a destination country for labor and business migration. The Estonian authorities constantly lift restrictions to facilitate the hiring process for entrepreneurs. For example, until 2013 employers were required to hold a three-week call for a specialist locally before looking for talent outside. Foreigners can work in Estonia based on either short-term employment or a temporary residence permit for employment. Employers must provide a salary 1.24 times the Estonian average wage and a minimum investment of at least €65,000 per applicant. Startups are exempt from the investment requirement. Companies like Transferwise, Axinom, Pipedrive, Eesti Energia, Tieto, Ericsson and others – all welcome highly skilled international talent to come and fill in the gaps. Kim Smirnov points out that Eesti Energia is actively searching for IT Specialists in the neighboring countries: Russia, Finland, Latvia, Lithuania, Belarus, and Poland. As I spoke to small and big business, all of them agree that different kinds of programmers are required, no specific preference is given to a particular software language. Software engineers with expertise in big data analysis, cybersecurity, Industry 4.0 and IoT will be especially welcome on the Estonian labor market. Fierce competition means that finding a top-notch software developer in Estonia is not a cup of tea for a startup or a mature company alike. Still, the challenges they will face on the Estonian labor market differ significantly. A startup entrepreneur will find that the best developers and even graduates go in the hands of the Estonian big guns, like Transferwise, that can offer very high salaries. Margus Tuvikene from Sensition, a startup building a focus assist device for filmmakers, confirms this assumption. He reveals that it is a very common thing for developers to work both at a bigger company and in a startup at the same time. A successful mature company will discover that the market has a lot of junior software engineers to offer, while the challenging tasks require candidates of a higher level. Take the example of Eesti Energia, operating in electricity and gas markets. I spoke to Kim Smirnov who manages Industry 3.5 Program aiming to enhance key business process in the oil shale value chain. Kim admits that the quality of IT specialists is unfortunately not satisfactory. A lot of juniors graduate from universities but they lack deep knowledge of a particular industry. That is why searching international talent and bringing them to Estonia is a feasible solution. An outsourcing company will realize that hiring people is only one part of the equation, and keeping them in the team is even a greater challenge, but it applies to other nearshoring locations as well. The Estonian ICT success story could not be possible without strategic moves undertaken both by the public and private sectors. E-residency program, highly developed IT infrastructure, ease of doing business, high cyber security rates and low corruption rates – all these factors influenced the ICT industry’s growth and prosperity. The biggest advantage of Estonia is its hardworking software engineers. According to industry insiders, Estonian developers are acknowledged by the quality of their solutions and the ability to deliver on time and on budget.